Kaiser Permanente mental health clinicians, represented by NUHW, have led the fight to improve access to care and achieve true mental health parity at the nation’s largest nonprofit HMO. These nearly 4,000 psychologists, therapists, social workers and psychiatric nurses in California blew the whistle on Kaiser for denying patients appropriate mental health care, resulting in a record $4 million state fine. With Kaiser still forcing patients to wait a month or more for mental health appointments, clinicians in December of 2018 held a five-day statewide strike that sparked public awareness about mental health and put intense pressure on Kaiser to address its failures. 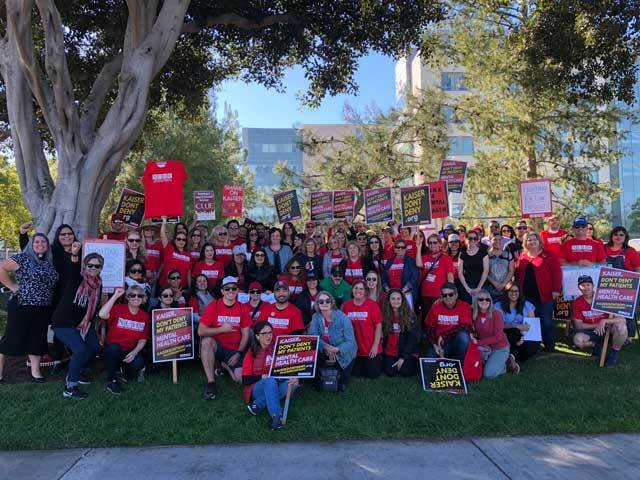 Kaiser mental health workers joined NUHW in 2010 because they wanted to belong to a union that valued mental health care and would help them fight for each other and their patients. 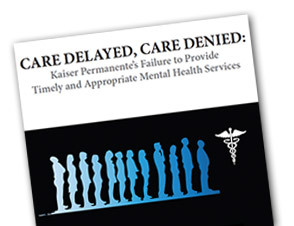 The next year, clinicians filed a complaint with the California Department of Managed Health Care documenting how Kaiser, despite having billions of dollars in reserves, refused to provide the mental health care services to which they were entitled under state and federal law. The report helped triggered a state investigation that resulted in the $4 million fine — the largest financial penalty levied against an HMO for violating California’s Mental Health Parity Act. Kaiser failed two follow-up state surveys and last year was forced to accept outside monitoring of its mental health services. Kaiser clinicians remain committed to making the HMO improve its mental health services. In 2015, they won a landmark contract that included provisions aimed at increasing staffing and reducing wait times for appointments. This contract also ushered in what clinicians hoped would be a new era of collaboration with management to make Kaiser truly the best place to give and receive mental health care. However, Kaiser didn’t honor its pledge. Three years after the contract was signed, Kaiser still had just one mental health clinician for every 3,000 Kaiser members. Continued understaffing means that patients with illnesses such as depression are still waiting more than a month to see their therapists, and therapists are leaving for jobs where they can provide the care their patients need. The December 2018 strike sent a powerful message that Kaiser must finally work with clinicians to fix its mental health services. We’re ready to roll up our sleeves and find sensible solutions that deny patients timely and appropriate care. But if Kaiser executives remain obstinate, we’re ready to keep fighting until they understand they can’t get away with shortchanging mental health care anymore.